Tap on the Lumin App icon. The app will ask you to log in. Enter your mobile number and press Submit. 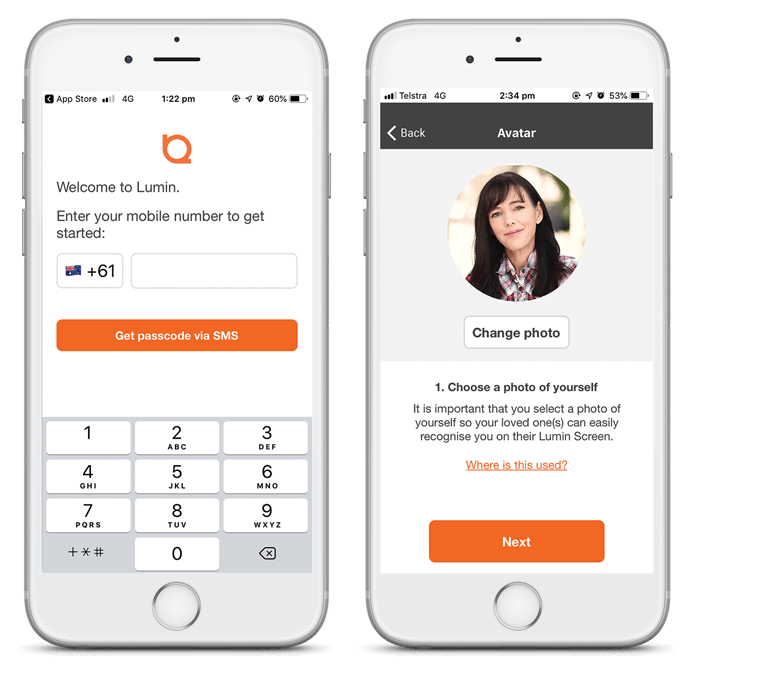 Important: If you are located outside of Australia, please include your mobile number's country code. eg +64 for New Zealand. Wait for the passcode. It will be sent to you as an SMS. Enter the passcode on the Lumin App. If logging in for the first time, you will be asked if you'd like to receive notifications. Press "Allow". This is very important to allow so you will receive notification and alerts from the Lumin screen. Add a profile photo of yourself by tapping on the Choose photo button and taking a picture of yourself or using a ready-made picture of yourself in your phone library. Important: The picture you will place here will be shown on your loved one's Lumin Screen when you call or send messages. Your profile details will be pre-filled but you should be able to edit it any way you want. Once your are done, tap on the Done button.